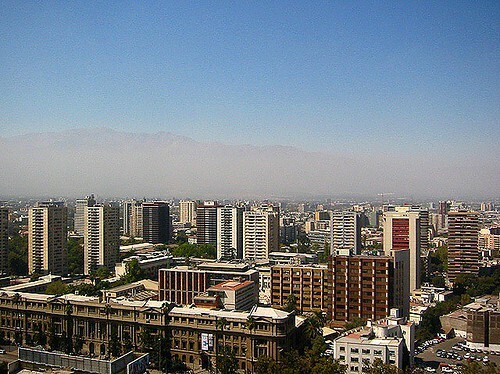 Santiago is the capital and largest city of Chile, and the center of its largest conurbation. It is located in the country's central valley, at an elevation of 520 m. Although Santiago is the capital, legislative bodies meet in nearby Valparaíso. Approximately two decades of uninterrupted economic growth have transformed Santiago into one of Latin America's most modern metropolitan areas, with extensive suburban development, dozens of shopping malls, and impressive high-rise architecture. The city has some of Latin America's most modern transportation infrastructure, such as the growing Santiago Metro (the metropolitan underground train system) and the new Costanera Norte, a toll-based highway system that passes below downtown and connects the Eastern and Western extremes of the city in a 25-minute drive. Santiago is headquarters to many important companies and is a regional financial center.